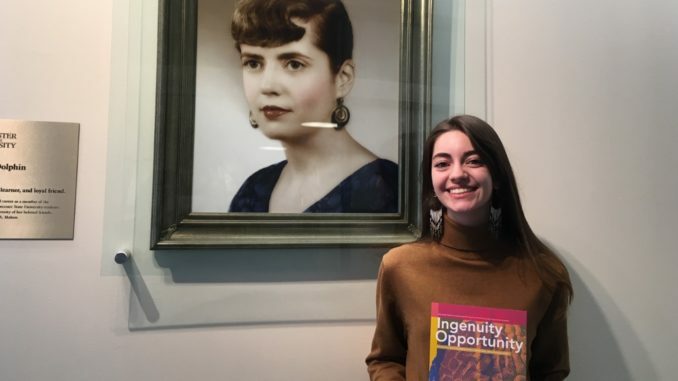 The Ingenuity Opportunity Exhibit not only showcases the unity between student artists from various local schools, but it also emphasizes the endless artistic opportunities provided by the Mary Cosgrove Dolphin Gallery on the Worcester State University campus. 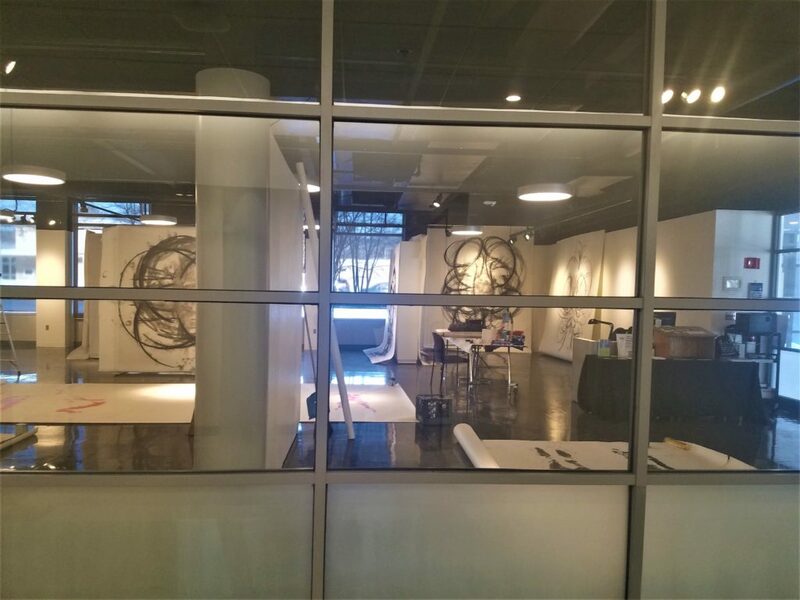 The new art exhibit will be open from March 28 to April 11, 2019, and is located in the Mary Cosgrove Dolphin Gallery, which can be found on the first floor of the Worcester State University Ghosh Science and Technology Center. The new student-curated and student-centered exhibit is a gallery that displays the artwork of students who attend local Worcester County universities and colleges in an effort to highlight the artists of the future. Boutiette had asked permission from the Visual and Performing Arts Department to curate an exhibit as a senior thesis project, explained Catherine Wilcox-Titus, an art professor at Worcester State and the director of the Mary Cosgrove Dolphin Gallery. All of the artists showcased in this exhibit are from local institutions within Worcester County, including Worcester State, Nichols College, Assumption College, Clark University, and Quinsigamond Community College. There are 39 local artists whose work was accepted and 49 pieces of artwork on display. There were 49 total artists who submitted artwork and over 100 pieces that were originally submitted electronically. 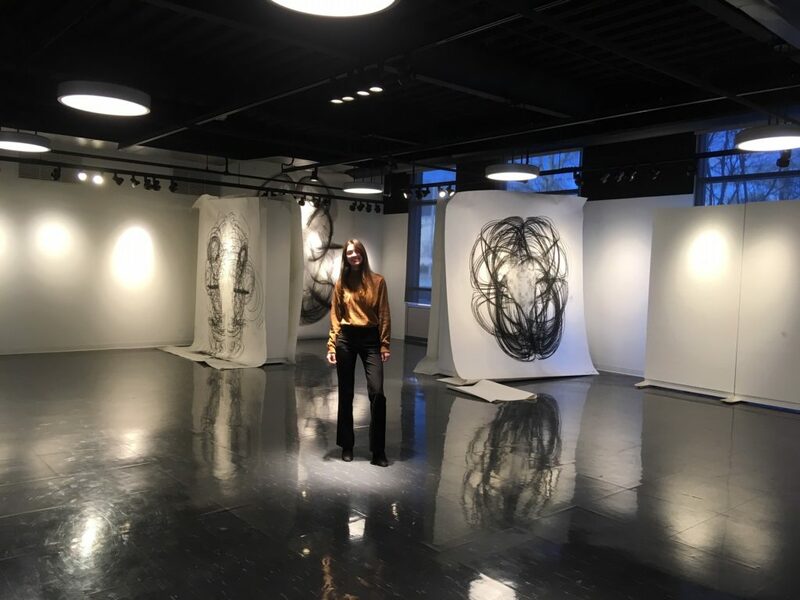 Boutiette believes that organizing the art exhibit allowed her to utilize skills that she most enjoys from both her business and visual and performing art majors. 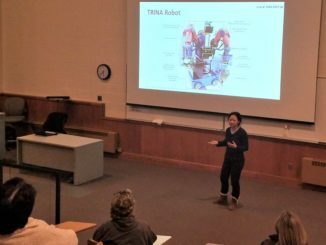 Boutiette explained that she appreciates the technical and analytical skills involved with business, but not the relentless capitalist aspects that are often involved with the field. By combining analytical skills with creativity in the curation process, Boutiette was able to execute a successful event that many of the involved artists appreciate. “I’m very grateful and excited to be a part of the exhibit,” said Austin McKinlay, a 19-year-old student artist from Charlton, Mass. whose artwork is displayed in the Ingenuity Opportunity Exhibit. When deciding what artwork to initially submit, McKinlay focused on pieces that allows viewers to contemplate the story of the subjects within the portraits. The artwork he chose for the exhibit capture candid moments of its subjects with a poetic perspective, he explained. Besides portraits, the Ingenuity Opportunity Exhibit integrated various other types of artwork as well. All of these different types of artwork were hung and prepared a week prior to the opening reception for the exhibit in the on-campus art gallery, a process which the gallery is familiar with. Throughout the years, the Mary Cosgrove Dolphin Gallery has hosted numerous exhibits that have displayed artwork from Worcester State students and faculty, as well as local members of the community. The space that the gallery currently occupies in the Ghosh Science and Tech building was previously used as a computer lab. Once students became required to have personal laptops, the space was available and chosen to be transformed into an art gallery. Despite the open room, there was still much work to be done before any artwork could be displayed. Worcester State had hired an architect firm to complete the necessary renovations. The many outlets on the floor that were there for the computers had to be removed. To make the space more appropriate for art exhibits, the ceilings were painted black so that they would seem higher up. For heavy objects to hang properly, the walls needed to be redone and movable walls were inserted in the room so that it would be a flexible space. Track lighting and a new floor were also added to the former computer room in order for it to be suitable for upcoming art exhibits. Students walking by the gallery in the Ghosh Science and Tech Building can often see various pieces of artwork through the large glass walls. The on-campus art gallery was named after and dedicated to the late artist and art professor Mary Cosgrove Dolphin on June 1, 2013. Mary Cosgrove Dolphin was an art professor at Worcester State for over 30 years until she retired in 1986. 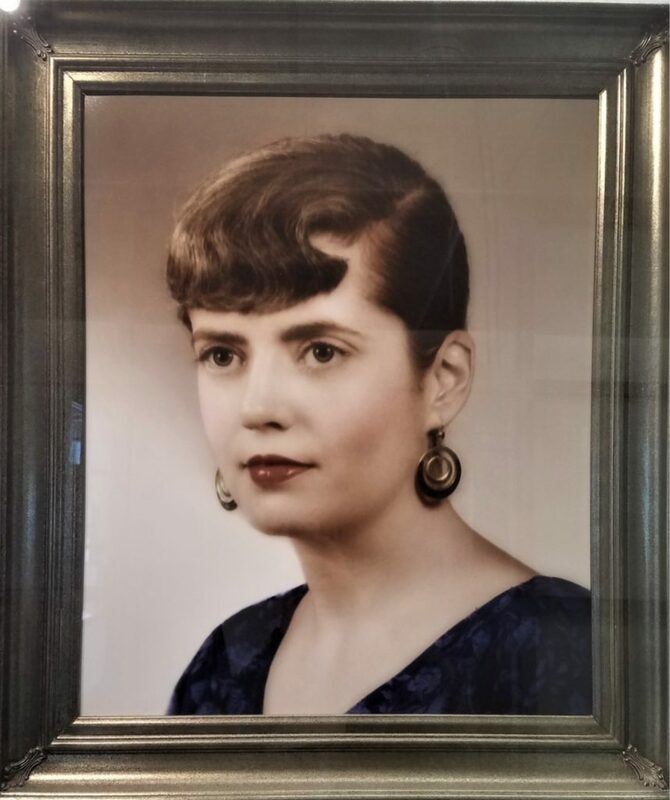 She was a Worcester native who earned a master’s degree from WSU in 1957 and gained international fame for her artwork in the 1960s and 1970s. At the dedication ceremony in 2013, family and friends reminisced upon Dolphin’s injection of innovation and individuality into the Visual and Performing Arts Department of Worcester State, which had elicited the best from all of her students. After Dolphin’s death in 1992, family and friends created the Mary Cosgrove Dolphin Art Award. This award is given to upper-level Worcester State students who excel in art. This gallery has provided visual and performing arts students at Worcester State the opportunity to showcase their artwork in a professional setting to better prepare them for their future careers. Ever since the renovations, the art gallery has been used multiple times per semester in order to showcase artwork. Every year, the Mary Cosgrove Dolphin Gallery offers three to four exhibits featuring the artwork of current artists, as well as visual and performing arts faculty and students. 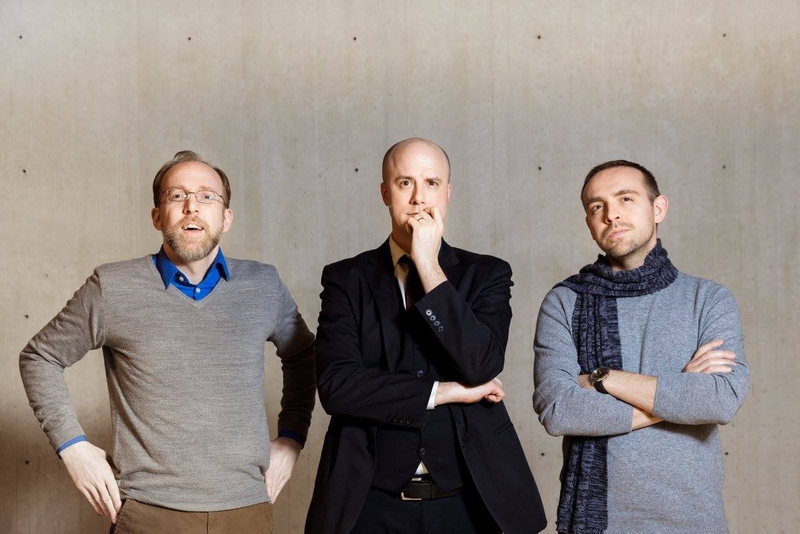 This gallery hosts student shows, faculty shows, thesis shows, and more. If the opportunity presents itself, students from visual and performing arts classes participate in pop-up exhibits, usually up for about a week at a time. The mission of the gallery is to contribute to the culture of the region by showcasing various pieces of interest in the contemporary art world, explained Wilcox-Titus. Local artists are regularly invited to show their artwork in the Mary Cosgrove Dolphin Gallery. This provides Worcester State University students the opportunity to meet the artists and intimately see their artwork in order to grow as artists themselves, explained Wilcox-Titus. Many local artists are fond of how the Mary Cosgrove Dolphin Gallery allows for the creativity of Worcester artists to flourish by having a place to showcase their artwork. Worcester County is an area that has many talented artists, explained McKinlay. He went on to describe the various murals painted on buildings throughout the city, like the artwork by BirchTree Bread Company, Crompton Collective, Seed to Stem, and WooBerry. McKinlay recommends that everyone take the time to visit these murals in Worcester. Besides artwork in the community, many students at Worcester State University also appreciate the incorporation of artwork on campus and hope to see more of it in the future. Mott explained that she would like to see more artwork around the campus and that a little bit of art in each building would be very beneficial to students. 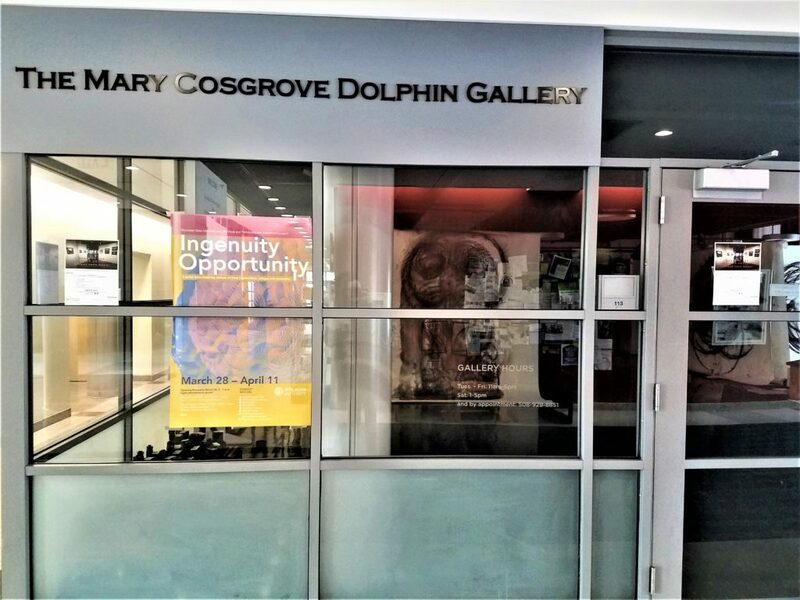 The Mary Cosgrove Dolphin Gallery is not only open to local artists, but also students, faculty, staff, and community members who would like to view the artwork. Ingenuity Opportunity had its opening reception on March 28 from 5:00 to 7:00 p.m. It will remain open and free of charge until April 11 for all interested students, staff, faculty, and community members to view. The gallery is open from 11:00 a.m. to 5:00 p.m. on Tuesday through Friday, and on Saturday it is open from 1:00 to 5:00 p.m. The gallery is also open by appointment. There are upcoming art exhibits that will be featured within the Mary Cosgrove Dolphin Gallery, which will still be open free of charge to all community members, students, faculty, and staff. From April 18 to May 7, 2019, there will be a Student Thesis Art Exhibition. For this exhibit, within the on-campus gallery, visual and performing arts graduating students will present their capstone projects to showcase their best artwork created while at Worcester State University. The Mary Cosgrove Dolphin Gallery will continue to be an area that provides experience for aspiring student artists and connect Worcester State University members with the local community.